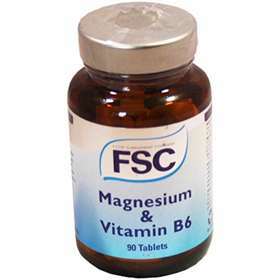 FSC Magnesium & Vitamin B6 90 Tablets Magnesium is a crucially important mineral for achieving optimal health, assisting the performance of a range of biological functions. It helps to stimulate the nerves and muscles, and importantly the heart helping it to function properly. A general health supplement used as a daily essential for energy production and balance. Helps address the loss of appetite, nausea and fatigue. Promotes energy, nerve and muscle activation. Prevents headaches, muscle contractions and cramps. Assists daily growth and repair, and general health. promotes the digesting of proteins, carbohydrates, and fats. Adults and children over 12 years of age; Take one to two tablets daily with food. Replace cap firmly after use and store in a cool dry place. Ingredients: Magnesium Compound(Oxide Citrate), Bulking Agents(Microcrystalline Cellulose, DiCalcium Phosphate) Vitamin B6(Pyridoxine Hydrochloride) Anti-Caking Agent(Magnesium Stearate).